This renowned Finnish driver is a legend in his own mind. He has been a mechanic at Kari Toyota/Jeep (and previously Eagle/Renault/ International Harvester/Studebaker) in Superior, Wisconsin, for 20 years. He is the only Toyota Master Mechanic north of the Twin Cities in Toyota's Chicago Region. He makes his home in Cloquet, Minnesota. 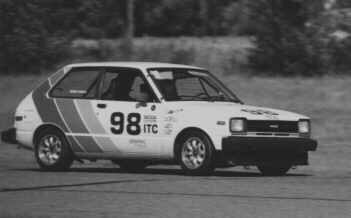 His ITC Starlet began its racing career as an ice racer in 1985, and was converted to road racing form for the 1988 season. During 1997, he traveled with Tim Winker, Diane Sargent, and Mark and Deb Strohm to Finland and Sweden. A highlight of the trip was a visit to Jokela, Finland, a village near Helsinki. Jokela has plans to switch to another Toyota, in another IT class, in the near future. Watch here for details on "Project X".